F-Series Super Duty on front lines of Ford campaign to protect commercial business. Kumar Galhotra, Ford president-North America, says the new F-Series Super Duty set for unveiling at the Chicago auto show is part of a broad product offensive the automaker will launch this year. With an eye on protecting its critical commercial business, Ford this week is unveiling the ’20 F-Series Super Duty pickup that will feature a new 10-speed transmission, a choice of three engines including a new diesel, high-tech trailer back-up assistance and more towing capacity. Kumar Galhotra, Ford president-North America, says during a briefing on the new trucks in the Ford portfolio that the new F-Series Super Duty set for unveiling at the Chicago auto show is part of a broad product offensive the automaker will launch this year. “2019 is a really, really big year. We’re going to be introducing a lot of new products, and we’re going to be playing to our strengths in trucks and SUVs,” Galhotra says, noting 90% of Ford’s investment in new products is devoted to new trucks and utility vehicles. The ’20 F-Series Super Duty is part of efforts to protect and expand Ford’s robust commercial-truck business by offering more power and more capability, he adds. Galhotra says the Super Duty has more power, more payload and towing capability and better technology than ever for demanding customers. The Super Duty had the highest market share in industries such as government with more than 60% share, petroleum with 50% share and utility services with more than 45%, according to Ford’s analysis of IHS Markit U.S. registration data from January 2017 through November 2018. With nearly a third of its sales going to commercial customers, Ford also has made a point of building up its service at the dealer level, Galhotra says. He notes that if it was an independent company, Ford’s commercial business would be one of the top 40 companies on the Fortune 500 with sales of $70 billion in 2018. The Super Duty is built at the Kentucky Truck Plant in Louisville and the Ohio Assembly Plant in Avon Lake. Galhotra says Ford is the only automaker that designs and manufactures in-house the engines and transmissions used in its heavy-duty trucks. The third-generation 6.7L Power Stroke diesel V-8 is upgraded to deliver more power and torque, Ford engineers say. In addition, an all-new 7.3L gasoline V-8 as well the standard 6.2L gasoline V-8 are available in the Super Duty. The 7.3L and 6.7L engines are paired with a 10-speed heavy-duty TorqShift automatic transmission. “With the addition of the 7.3L V-8, upgrades to our 6.7L and the debut of an all-new 10-speed transmission, we are delivering the strongest, most capable Super Duty powertrain offerings yet,” says Mike Pruitt, Ford Super Duty chief engineer. The 7.3L is expected to be the most powerful gasoline V-8 in its class once tests are complete, Pruitt says. It uses an all-new cam-in-block, overhead valve architecture with cast-iron block and forged steel crankshaft for maximum durability. Port injection with variable valve timing optimizes the intake and exhaust to match performance with workloads. Oil jets cool the pistons under heavy loads. Super Duty’s 6.7L Power Stroke Diesel includes a 36,000-psi (2,482-bar) fuel injection system with all-new injectors that precisely meter and spray up to eight times per intake stroke to control noise levels and optimize combustion. An innovative inboard exhaust on the diesel V-8 also features a redesigned electronically actuated variable-geometry turbocharger that provides improved pumping efficiency and throttle response, the automaker says. Ford also has enhanced the strength of the cylinder heads, block, connecting rods and bearings to handle higher cylinder pressure and increased output. New steel pistons provide higher firing pressure capacity and less friction, which improves performance and increases horsepower and torque. The heavy-duty transmission comes with class-exclusive live-drive power takeoff, which allows the operator to engage industrial equipment and accessories, such as snowplows, with the truck in motion. The electronically controlled transmission has drive modes that include normal, tow/haul, eco, slippery, deep sand and snow. Even with four extra gears the entire unit fits in the same space as the 6-speed and weighs only 3.5 lbs. (1.6 kg) more. 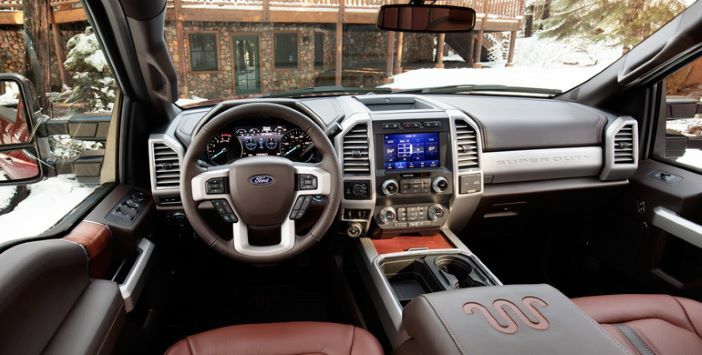 Inside (below), Ford is adding technology to make the Super Duty easier to handle. For 2020, the new Pro Trailer Backup Assist simplifies negotiating even the largest trailers into the tightest of spaces, the automaker says. With hands off the steering wheel, drivers use the Pro Trailer Backup Assist knob to steer the trailer via a reverse camera. The truck’s Trailer Reverse Guidance system shows trailer angle and direction and provides steering suggestions to most efficiently direct a trailer backward. Both systems are built to accommodate all trailer styles, including fifth-wheel and gooseneck trailers. FordPass Connect with 4G LTE is standard, and wireless smartphone charging is available. Driver-assistance features such as automatic emergency braking are standard on XLT trim series and above, Ford says.